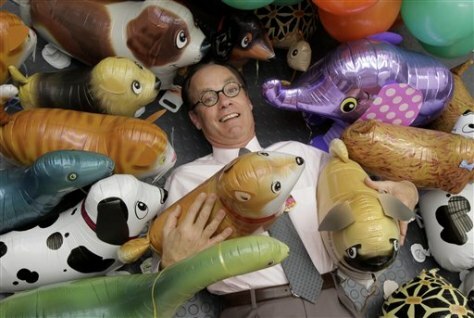 Treb Heining poses with balloons in his office in Costa Mesa, Calif., on June 2. When he was a 15-year-old kid hawking balloons down the street at Disneyland, Heining never thought his love for helium-filled spheroids would, well, balloon the way it has. If you've never met Heining, the chances are great you've bumped into at least one of his balloons. He's the guy who has dropped millions of them on Times Square New Year's Eve celebrations, presidential nominating conventions (for both Democrats and Republicans) and more than a dozen Super Bowls.